Once you have decided that you want to come to Sal for either a Marriage Blessing, Renewal of Vows or Love and Devotion Reading and wish to book the service through us, we will require you to pay a 25% of our costs for our service, this will be the non-refundable booking fee. It should be paid by bank transfer. Following that, 25% paid is to be paid on the day of the pre-meeting, then the remaining 50% on day of ceremony. These costs may require a deposit or a payment for the full amount 7 days before the ceremony. Some couples transfer the money by bank transfer in advance of arrival on Sal. You must confirm your arrival date and place of stay prior to arriving on Sal. On arrival you should send us your room number (if staying in a hotel). You may not want to use your phone due to high call charges made by your service provider, however you can use Wifi at your hotel or at local bars or restaurants to reach us if there is something we need to know, you can use Whatsapp for that purpose, if you have it on your phone. We will supply a contact number. 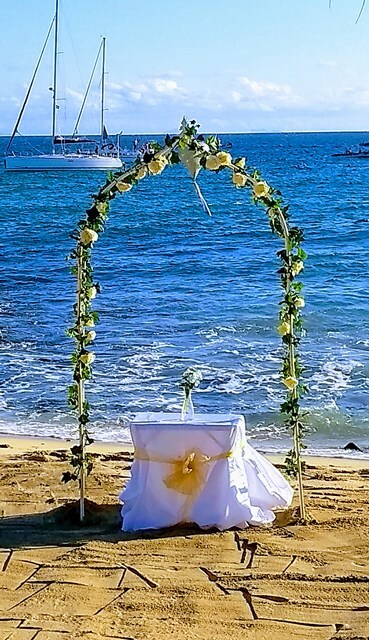 Prior to arriving on Sal, we will arrange a date and time with you to have a Pre-Ceremony-Meeting with us on an agreed date and time soon after your arrival at or near the area of beach we will be useing for your ceremony. We will tell you where the ceremony will be held so you can give the taxi driver bringing you to the Pre-Meeting, clear directions. For example if we agreed the ceremony was at Porto Antigo 1 (you must tell the taxi driver its Porto Antigo 1, as there are three Porto Antigo's). We require you to send us a recent photo of you both so we can identify you when you meet us at the pre-ceremony-meeting. A marriage certificate will be required from couples already married that are having a ceremony performed by the Pastor. If you have asked us to organise a ceremony performed by a Pastor of the Church of the Nazarene (Evangelical Church) then although they are non-legal marriage ceremonies, the Pastor will normally also want to meet the couple before the ceremony day, only if they are going to get married officially at another time in another country. A translator is also present on those occasions if the couple do not speak Portuguese. A translator is also present at the ceremony if its a non-speaking Portuguese couple. Please note the service with the Pastor and translator takes longer as the Pastor will perform the ceremony as if it is official, there are additional costs for this service. There are taxi's at or outside hotels on the west coast and they could charge 3-4 euros and take 5 mins to bring you into to Santa Maria or from Santa Maria to Ponta Preta. There are other venues we use for beach ceremonies, but we will make sure you know exactly where they are and how to get there on foot in case you are already in Santa Maria or 'out and about' and won't be using a taxi. Myself or my assistant will meet you at the Pre-Ceremony-Meeting venue on the day and time agreed and introduce ourselves to you. We will show you where the ceremony will take place and just give you some info and a few pointers, the meeting can last up to 30-40mins and you can ask any questions not previously covered. You are then free to leave or you may want to return to your hotel. On the day of the ceremony, we arrange for you to be collected from your hotel about 15mins before the start of the ceremony, the driver will know where to bring you and, either myself or my assistant will be waiting to meet you at the ceremony venue. After the ceremony you can have some more photos taken. You can then decide whether to stay in Santa Maria or return to your hotel. Before you depart, you will need to agree a day and time with the photographer to go and see the photos and collect the usb with the photos on it, before you leave Sal. We will show you where the photographer is located when you come along to the pre-meeting or give you directions. I will send you some options for the Renewal of Vows readings, Marriage Blessing or some short poems to consider adding into the reading, just let me know which reading you have chosen a week before the date of the ceremony. I also need to know if you want to exchange rings so we can let the Layperson know and, include it in the reading. You can provide us with a copy of a marriage certificate when you send us your chosen reading for renewing your vows with your photo, info on exchanging rings for other non-pastor ceremonies, however it is not a necessity, don't worry if you can't find it, its something I keep till the ceremony is over. As from January 2019 we will introduce our 'Simplicity' Service aimed at those interested in a ceremony package price with our white decorated arch. This package will suit those wanting a Love and Devotion reading, Marriage Blessing or Renewal of Vows reading. What this means is, for 'one price' you will have several things included in your service, with the option to add other items that will have additional costs, such as the cost for a photographer. The image below is of our 'Simplicity' set up. Further information on our 'Simplicity' service and what it includes is available within the weddings secure zone, under 'Prices'. Some ceremony arrangements may require more organisation than others, for example, those that we arrange at hotels on your behalf, may require additional time to organise. The hotels that we work with sometimes introduce new charges, or different charges to what was previously quoted. A list of costs based on what you require under 'additional services' will be provided, but may need amending. Please provide as much information as possible, to enable us to identify other associated organisational costs, time, labour etc in providing your service.